Batman: The Animated Series still remains as one of the most iconic takes on the Dark Knight years after it graced our screens. 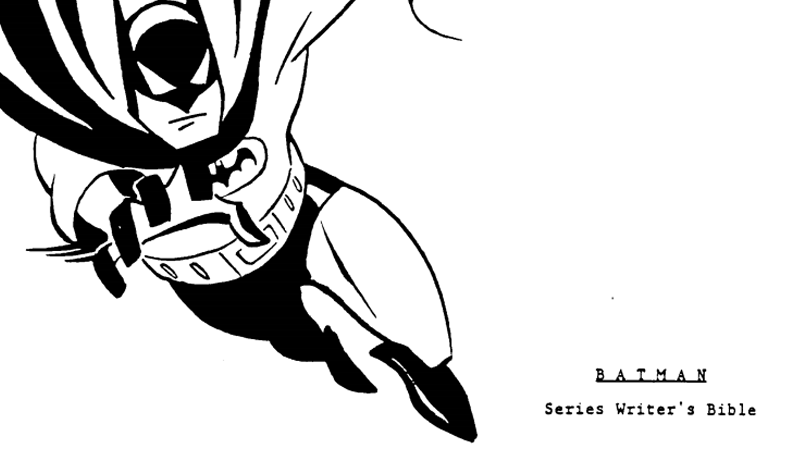 But to get there, the team behind the show needed to lay out their grand plan for who their Batman should be—and reading through the guide they wrote ahead of the series gives us some fascinating insights. The series bible—the guide written by Bruce Timm, Paul Dini, and Mitch Brian outlining the show’s plans for its take on Batman and his supporting characters, the world of Gotham, and even just the general writing style and format of the series—has been floating around the internet for a while, having first been re-discovered back in 2009. But even now, flicking through the entire document, it’s remarkable to see how the plans for what would become one of the most famous and beloved animated series of a generation were put together. One of the most crucial parts of the bible is in part of its opening statement about how the series will differ from myriad other takes on Batman: an unflinching resolve to never explore Batman’s origins, out of respect to the fact that their audience is likely already more than familiar with the hows and whys of Bruce Wayne becoming Batman. Which, in hindsight—and in an age where we’ve seen tons of takes on Bruce’s origin story since Batman: The Animated Series—is perhaps one of the best opening statements the writers could’ve had. Although today the idea of Batman being the real person and Bruce Wayne being the disguise isn’t exactly new, for the time of The Animated Series it was a relatively fresh concept. Bruce Wayne is barely a character in the show, and that was always the intention, according to the guide, because the show is about Batman and what he does, rather than the times he’s not fighting crime. Harley Quinn is obviously the most famous character created for Batman: The Animated Series that eventually came to the comics, but she wasn’t the only character made for the show who’d eventually have a life beyond it in DC’s comics. Ahead of her debut in the show, Renee Montoya was pre-emptively introduced into the comics in the early ‘90s, but the BTAS writer’s bible has a bit of background story not used in the show that would’ve eventually clashed with her arc in the comics: she was meant to be a widower, having lost her husband, a fellow officer, in the line of duty. In the comics, of course, Renee went on to become one of DC’s most prominent lesbian characters instead. Since the series was already concerned with how to handle its humor avoid Batman ‘66-style camp, it was extra-careful in how it wanted to portray Batman’s most famous villain, the Joker. Comical, classic clowning around was encouraged when it came to stories featuring the character, with reminders that funny faces and slapstick routines should be part of his repertoire. But not too much—one-liners and bad puns were apparently off the table. Above all, the guide tells us, the key to the Joker’s goofiness was that it could always snap back to his violent, dangerous streak. He might have been clownish, but he was always fiendishly clever and a ruthless killer, too. While the guide mostly focuses on how to interpret Batman, his rogue’s gallery, and the show’s host of supporting characters, it also features some commentary on the show’s writing style and main format. Like many shows before and after, the classic three-act structure was used, but with one specific request of writers: there must always be a major, action-packed set-piece sequence in every episode. Writers were pushed to be as big and as bold as possible in their writing to use the almost limitless scope of animation to their advantage, and that this imagination should be particularly applied to coming up with the biggest and best fight sequences they could imagine... which is why we eventually got crazy stuff like Batman dueling his own robot duplicate in “His Silicon Soul”, or an unmasked Bruce fighting a ninja in front of an erupting volcano in “Day of the Samurai.” When The Animated Series wanted to go big, it went big. You see can the entire series bible for yourself here. It’s a fascinating look at what is still arguably the finest superhero cartoon ever created.